Ten minutes late, we were first ushered into the ‘crying room’ to wait out the lock out period, before we were allowed entry into the theatre to see Mia Blake’s Venus, a gym bunny turned yoga instructor, trying to teach Ian Hughes’ Dave the downward dog and other yoga basics. Dave proves that yoga is not as simple as the thousands of YouTube videos will have you believe. Pure and Deep has been described as a sequel to Bare, Fraser’s 1998 play about urban life in late 20th century New Zealand. It is a sequel in both the literal, character sense (the leads Venus and Dave appeared in Bare as well) but also in the meta sense. It is A second interview with New Zealand, to see how it’s feeling on life, 16 years (and another millennium) on. While Venus, a slightly lost woman in her late 30s who longs of opening a yoga study at a western Auckland beach, and Dave, a film buff turned ‘transmedia consultant’ , are the guiding characters of the story, their story and that of life in 2014 New Zealand is also told through many other characters – all played by Blake and Hughes. Blake especially moves through a kaleidoscope of characters, of both genders, with ease, from the pampered Russian housewife to the young Piha youth, to a South American lothario. These characters and their take on modern life swirl around Venus and Dave, as they reconnect after 16 odd years apart. He gave a Ted Akld talk, she tweeted about it. No longer the optimistic youths they were in Bare, Dave and Venus are now mid career adults, trading stories on how their lives differed from the plans of their youth. Fraser has created a cast of character who offer some stark and poignant social commentary and self deprecatory humour at the expense of New Zealand. The Russian who thinks that New Zealand has too many fat people ‘everywhere I look at airport – fat people’, the rapping Mount Roskillian whose caught up in social media, the young cafe goer who is offended when gluten is brought into her presence, the doctor who notes that the Crossfit fad is doing more harm than good to the desk-bound bums who take it up. Many of the characters connect to Piha in some way. This West Auckland beach is a place seen for its summer beauty, but more strongly a place associated with darkness – bleak winters and suicide. The slow revelation that Venus’ boyfriend, a famed league player, drowned himself at Piha some years before, is one of the play’s most powerful plot points. There are times when the characters themselves are lost under the weight of what Fraser is screaming out at his audience. Powerful words of activism and the need to recognise the ongoing affect of what we’re doing now – to our people, to our plan, to our identify. 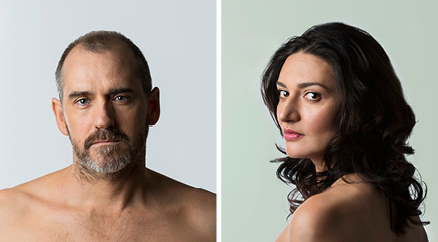 These are important messages to hear, and with minimal staging of just the two actors and a couple of chairs, its easy for the monologues of the characters to merge into the words of the playwright – desperately calling out for action amongst the New Zealanders who he has captured in the play. Fraser has said ‘this (Pure and Deep) has a lot of me in it, but possibly not in the obvious ways.’ Perhaps I give the playwright too much credit for the words of his creations, as there is of course a great distinction. I doubt this though. Pure and Deep makes a battle cry for New Zealanders, and global audiences, to engage in the world around them, to take ownership for the place and time and way in which they are living, rather than just passive consumption of information and date. Just information which is globally available for consumption….unlike this stunning New Zealand reflection.